book one of your behind-the-scenes experiences. Your entry fees directly fund the running of Bonorong Wildlife Sanctuary, as well as the operation of all of our conservation programs. You'll be able to visit our Sanctuary for the day, see our animals, join one of the daily tours and more. Entry includes a free bag of kangaroo food, and access to our daily tours. Our roos roam free within the Sanctuary and are always keen for a good scratch on the chest and gentle hand feeding. See a Tasmanian devil on our daily guided tours. Full public tours are included in your entry fee and take place every day at 11:30am, 2:00pm and 3.30pm and run for approximately 45 minutes. A 15-minute session focusing on the Tasmanian devils is repeated at 10am every day (this session is included in the 45 minute tours). All public tours allow visitors to see the Tassie devil eat a snack, learn about their quirky personalities as well as some of the threats they face and the efforts to help protect them. 15 minutes on the Tasmanian Devil (this talk is included in our full daily tour). 45 minute tour. Meet the wombats, devils and koalas. Full tours also include the opportunity to meet our wombat and koala and gently feel their fur (if they are feeling up for it). One of our knowledgeable keepers will introduce you to some of Bonorong’s favourite species and share with you their passion and concern for Tasmanian wildlife. Not only do we aim to entertain you, we are committed that you will leave Bonorong with the tools to help conserve Tasmania’s unique wildlife. What can you do to reduce roadkill? Or help the Tassie devil in its fight against disease? Visitors and Tasmanians alike can play their part in looking after our wonderful creatures. Prefer to self-guide? Allow an absolute minimum of an hour to wander around the Sanctuary. Get up close with a bare-nosed wombat! Spend an unforgettable 10 minutes up close with one of our friendly critters! Minimum 2 guests, maximum 4. Morning and afternoon options. Minimum 2 guests, maximum 8. Afternoon options. Minimum 2 guests, maximum 8. Morning and afternoon options. It's snack time at the Sanctuary and you're invited! It’s feeding time at the Sanctuary and your guide will help you to get up close to as many different animals as possible in two and a half hours! You will enter our animals’ world and experience hand-feeding weird and wonderful creatures like Eastern quolls, tawny frogmouths, sugar gliders... and of course, Tasmanian devils. Accessibility note: Our wombat encounters are wheelchair-friendly (please advise when booking), however our sugar glider and tawny frogmouth enclosures which are not currently wheelchair accessible. Visitors using wheelchairs are welcome to accompany their group to watch the sugar glider and tawny frogmouth encounters free of charge. You will enter our animals’ world and experience hand-feeding weird and wonderful creatures like eastern quolls, tawny frogmouths and sugar gliders… and of course, feed our Tassie Devils some tasty snacks. A private, premium experience for you with our animals. 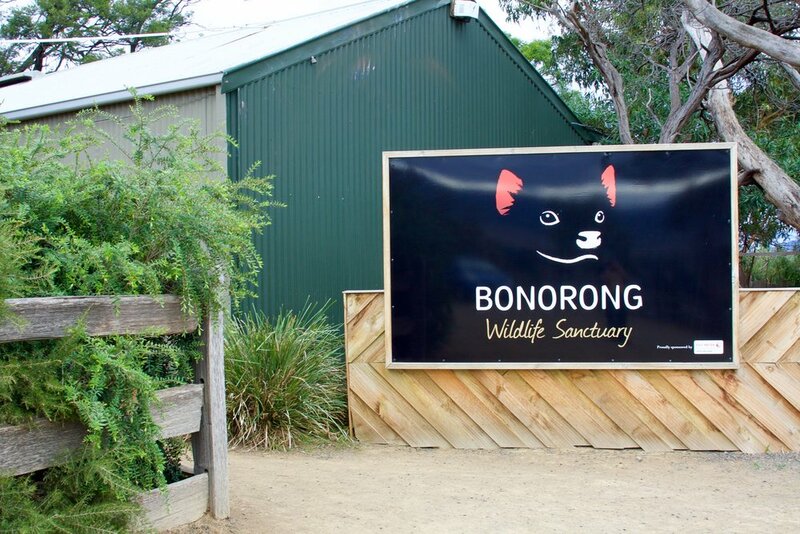 The Bonorong Private, Premium Feeding Frenzy is an exclusive feeding tour; a private experience just for you and whoever you are with. One of our most experienced keepers will be your guide for the duration of this intimate, private tour. A glass of Tasmanian sparkling wine or fruit juice will greet you upon arrival after which you will observe our curious native wildlife during the day time. The Bonorong Private, Premium Night Tour is an exclusive feeding tour; a private experience just for you and whoever you are with. A member of our management or one of our lead guides will be with you for the duration of this intimate, private tour. A glass of Tasmanian sparkling wine or fruit juice will greet you upon arrival after which you will observe our curious native wildlife during their natural waking hours.